Three months into his first deployment, Army Sergeant Kevin Jaye, an Infantryman with the 1-64 AR 3rd Infantry Division, stepped on a pressure plate improvised explosive device while on dismounted patrol in the Panjway District of Afghanistan on June 24, 2012. The blast resulted in the loss of his right leg and extensive damage to the left leg and ankle. SGT Jaye spent more than two years at Walter Reed Medical Center where he has undergone more than 30 surgeries. In an attempt to save his left leg, doctors did an ankle fusion, which requires him to wear a brace when walking long distances. However, he hasn’t let the pain stop him from participating in activities. He recently walked in the Army Ten-Miler in Washington D.C. and hopes to make his left leg strong enough to run it in the future. Kevin has aspirations to finish school and be supportive of his community. His previous home was “physically and emotionally” draining and hindered him from doing as much as he wanted. 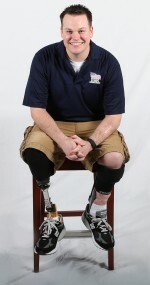 His specially adapted Homes For Our Troops home is adapted to his injuries, alleviating his challenges and allowing more time to focus on his goals. He would like to complete his degree as a computer support specialist and empower fellow injured Veterans and others with his story. He has already spoken at elementary schools. “My goal is to show people, that with a positive attitude, dedication, and determination, you can achieve the unimaginable. This home would allow me to share my story, make sure my family is taken care of and give me the independence I need to be successful and be an asset to my community,” he says. Originally from Maryland, Kevin and his wife, Lauren, chose to remain in state to be close to family. They became parents to their daughter, Claire, in August 2016. Kevin says the home has helped him greatly in being a parent. “I can carry my daughter to bed, whether I’m in my wheelchair or am walking. I can get to her quickly if I need to. I can do everything that all fathers love doing with their child and it is an amazing feeling,” he says.